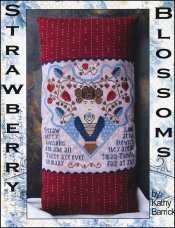 Strawberry Blossoms [G1487] - $10.00 : Yarn Tree, Your wholesale source for cross stitch supplies. Cross stitch pattern by Kathy Barrick. Do you love strawberries? This pattern is going to make you hungry for some! A woman stands in the middle of this design with strawberry blossoms stitched above her head. "Strawberry blossoms one and all there are ever so many. Look at the flowers they are so small - thouth fair as any," saying is stitched below the woman. Stitch count 149 wide x 149 high.